Mexico’s favorite “tipple” has a long and fascinating history. Historians have debated for years precisely when the spirit was first distilled, and precisely where this took place. John Pint, writing in MexConnect, has written a great article about the area around the town of Tequila (Jalisco), the heartland of tequila production. He presents a strong case that the nearby town of Amatitan has a longer history of tequila making than Tequila, and explored the backcountry for the remains of what is reputed to be the first place where tequila was distilled by native people, finding ruins of early ovens which may predate the Spanish conquest. The article includes a fine series of photos. John Pint’s article on MexConnect. 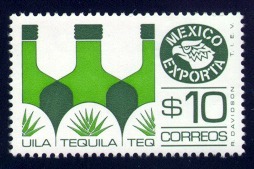 Tequila gets several mentions in Geo-Mexico: the geography and dynamics of modern Mexico. Tequila volcano is included on the map of Mexico’s major volcanoes in chapter 2, while the importance of tequila (the spirit) and other “agricultural” exports is examined in chapter 20. The short-lived Republic of the Río Grande How big is Lake Chapala?